For the past several years, Clif and I have bought a summer CSA (community supported agriculture) farm share from Farmer Kev, one of our favorite young farmers. In previous posts, I’ve written about Farmer Kev, so I will be brief: He’s still in his twenties, was bit by the farming bug as a young teenager, but doesn’t come from a farming family. Farmer Kev is a friend of the family and is one of the hardest-working young men that I know. This year, for the first time, Farmer Kev offered a winter CSA farm share, and Clif and I did not hesitate to buy one. As a result, we’ve been getting vegetables that store well over the winter—beets, carrots, potatoes, garlic, and lots and lots of squash. The time had come, I decided, to make a spicy squash soup. 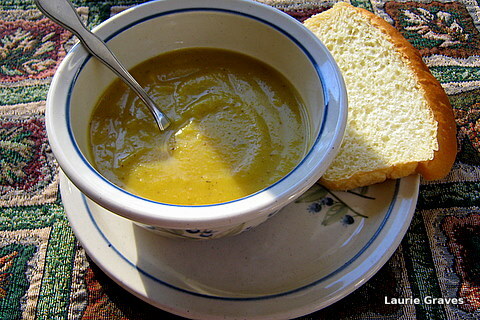 Any squash will do for this soup, but as I had an abundance of acorn squash, that is what I used. 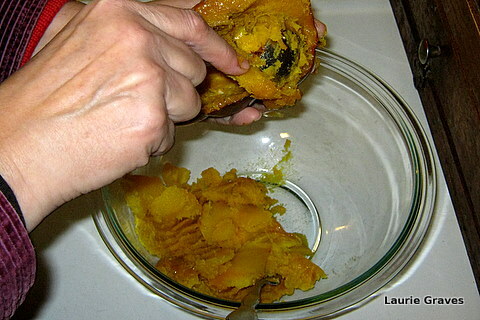 The soup is a two-step process because baking acorn squash first is the easiest way to mash it. Even though the hands-on time is minimal, I usually plan to bake the squash one day and make the soup on the following day. This time was no different. I baked the squash on Monday and made the soup on Tuesday. 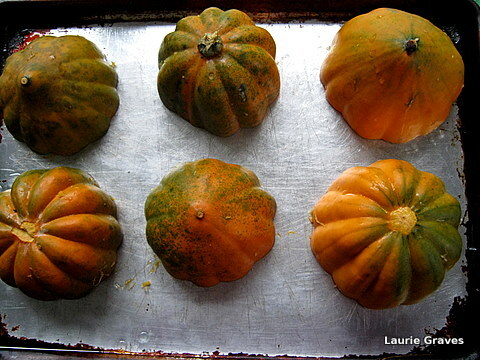 To bake the squash—I used three—I greased a baking sheet, cut the squash in half, scooped out the seeds, placed the squash face down on the baking sheet, and baked them for an hour or so at 350 degrees. 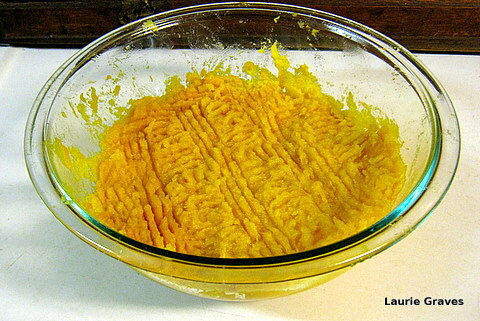 When the squash was very soft—I poked it with a fork to test it—I removed the baking sheet from the oven, let the squash cool, and then mashed it into a bowl, which was then stored in the refrigerator until the next day. Note: If you are an early bird, then the baking of the squash and the making of the soup could easily be accomplished in one day. Next came the making of the soup base. For this I used potatoes, carrots, and garlic, all courtesy of Farmer Kev. (I also used an onion, which, alas, I had to buy at the store.) I sautéed the vegetables, added water and spices, and simmered them for about an hour. When the potatoes and carrots were very soft, I blended the cooked squash into the simmered vegetables. And then there was soup. Clif likes his soup to be bulky with either crackers or pasta or some other ingredient to “fill it out,” as he puts it. So I usually cook some pasta to go with puréed soups, and the pasta is added to the bottom of the bowls rather than to the soup itself. That way, the pasta doesn’t swell into something unrecognizable. I just thought of another reason why I bake the squash the day before. That way, the oven is free for me to make homemade bread to go with the soup. Hot soup and homemade bread on a cold January night. Pretty darned good, as my Yankee husband might say. In a large stockpot, heat the oil and add the potatoes, carrots, and onion. Sauté for five minutes and add the garlic, sautéing for 30 seconds. Add the water and the tarragon, celery seed, cumin, white pepper, and salt. Simmer for about an hour, until the vegetables are very soft. Blend the squash into the cooked vegetables. The best way to do this is with an immersion blender. Set the stockpot in the sink, add the squash to the pot, and blend away in one easy swoop. You don’t have to worry about burning yourself, and you don’t have the mess of blending it in several batches. Whoever invented the immersion blended should be pronounced a hero to home cooks everywhere. If you don’t have an immersion blender, then use a blender with a glass pitcher, do it in batches, and be careful not to burn yourself.